Everyone discovers a doll sooner or later that is hard to identify. 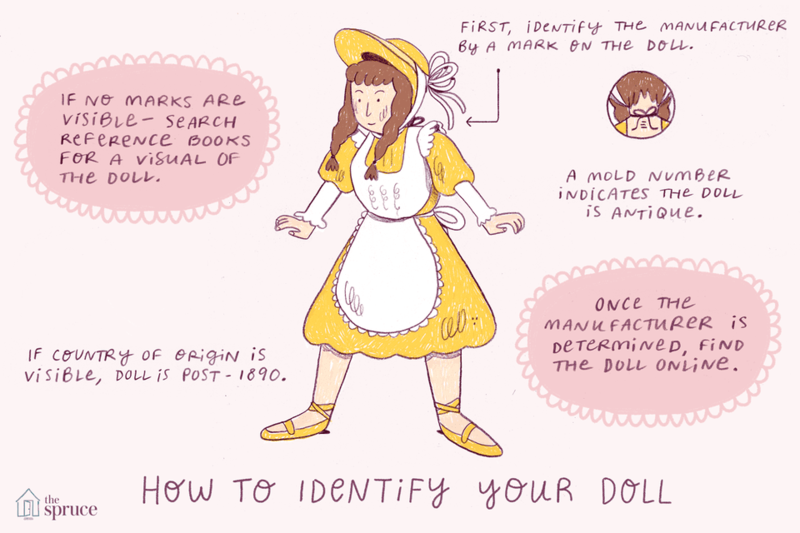 A good doll identification guide will always help, as will a magnifying glass. Here are some general steps to follow that may help you identify the name and/or manufacturer of a doll. First, examine the doll thoroughly in good, clear lighting. Note the size of the doll, the material the doll is made of, the type of eyes, hair and clothing details. Next, check the doll for markings. Most doll marks are found on the back of the head, on the torso, and sometimes the feet. All letters, numbers, and symbols may be important. Don't forget to look for labels on the doll clothing, or paper labels. Who Is the Doll Manufacturer? If the markings contain the name of a doll manufacturer, you are halfway there! Mattel, Madame Alexander, Ideal, and other modern doll makers often mark dolls with their name as the sole mark or as part of the mark. Antique dolls such as Armand Marseille or Simon and Halbig may also be clearly identified on the back of a doll's head, but this is not the case for most antique dolls. Usually, dolls made after 1890 or 1891 are marked with the country of origin. If the manufacturer is not named in the mark, check doll reference books to determine who's mark it is. Many reference books will list marks in an appendix, alphabetized or in numerical order. Many antique dolls are marked with a mold number, and the mold number may be enough to identify the maker of the doll. If your doll has no marks, your job will be more difficult. You will have to search for books to find and identify your doll visually. Having an approximate date of manufacture will help—if you know the date that the doll was purchased, or if the doll belonged to your mother or grandmother as a child, you can narrow that important date down to a decade or even a precise year. eBay, Doll Shops United, Doll Reference.com, Antique Doll Content, and Etsy are good places to look. Ruby Lane also has good information and photos for identifying dolls. Once you know the doll manufacturer, you can search reference books and online sources such as this site and also eBay (which have many doll photos!) to find your doll. Sometimes the markings alone will tell you which doll you have (such as AM 390 = Armand Marseille, Mold #390). Other times, photos and the characteristics that you found when you examined the doll will help you determine which doll you have. If you cannot find your doll using these methods, you can find out the manufacturer and/or name through a doll appraisal at doll shows or doll shops. Some are free, and some require a fee. You can also find online doll appraisals for a fee. Many dolls can be adequately identified via online photos. Not all dolls can be identified! Especially difficult to identify are unmarked dolls of any kind, tourist dolls, and less-expensive supermarket line and drug store dolls. Sometimes, an era and type of doll are all that can be determined, such as "1940s Composition Child" or "French celluloid tourist doll from the 1930s". Also difficult to identify are many dolls made in Asia (often sold through magazine ads, gift shops, or general retailers) during the last 30 years.